Read the textbook chapter 20. Check the remarks by Professor Blois and Professor Evans on Peter the Great. Study the Questions to Consider and the Key Terms for the Unit. Post (or respond) your thoughts/ideas about this Unit's reading and assignment in the Blackboard online discussion forum. Do not post your assignment there. In 1985 Professor Blois interviewed Robert Massie, author of the definitive (and massive) biography of Peter the Great (Peter the Great, 1981). This was just before the prime-time, mini-series based on that book was about to appear on television. Read some excerpts from that interview (used with the permission of Robert Massie) in *.doc or *.pdf format. Read chapter 13, chapter 14, chapter 15 and chapter 16 from Mary Platt Parmele (1843-1911) A Short History of Russia (1907, 4th edition). These are short chapters, and this is optional reading. For extra credit please suggest to your instructor a relevant video for this unit of the course. Send the title of the video, the url and a brief explanation of why you find the video interesting and applicable to the material that is being studied in this unit. For 50 points maximum extra credit, read Alexei Tolstoi, Peter the First (1945) and write a one-page paper that explains how Tolstoi's "novel" adds to our understanding of Peter the Great. For 50 points maximum extra credit, read Robert Massie, Peter the Great, His Life and World (1980) and write a one-page paper summarizing the contents of this massive biography. 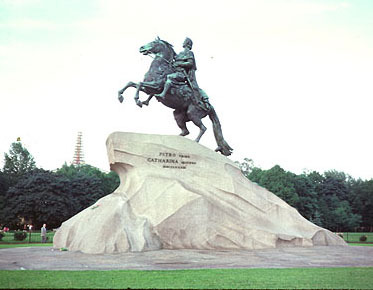 Read Aleksandr Pushkin, "The Bronze Horseman" (or the Bonver translation). You can also look at the Bronze Horseman statue (or a more dramatic photo of the statue). For 25 maximum points extra credit, write a paragraph that conveys your understanding of Pushkin's appreciation of the statue. One of Russia's most famous paintings is Boyarina Morozova (1887) by Vasilii Surikov that captures the conflict between Old Russia and New Russia started by Peter's father. For 25 points maximum extra credit, write a paragraph that answers the question of how much "western" influence was present in Russia before Peter the Great. For 25 points maximum extra credit, read the remarks on Peter the Great by Robinson and Beard (1921) and write a paragraph comparing those remarks to the coverage of Peter the Great in the Riasanovsky textbook.